Good landscape lighting is easily one of the best ways to beautify your outdoor spaces, but hardwiring your back yard for electricity is far from a DIY weekend project. That said, adding little light to your outdoor spaces doesn’t have to be a big ordeal. 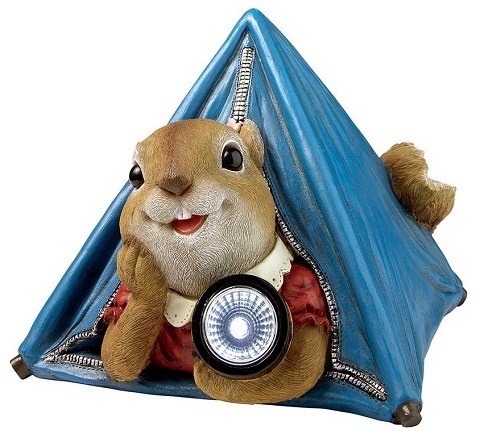 Solar powered LEDs and candle-lit garden lanterns don’t require any wiring, and while they produce a little less light, they often come in really adorable shapes and styles. These individual small, sculptural lights require almost no set up, but illuminate your space during the evening and add a touch of whimsy to your yard when the sun is up. Traditional electric lights certainly provide the strongest, brightest landscape lighting, but installing them requires digging up big chunks of your back yard to run wiring to each individual fixture. 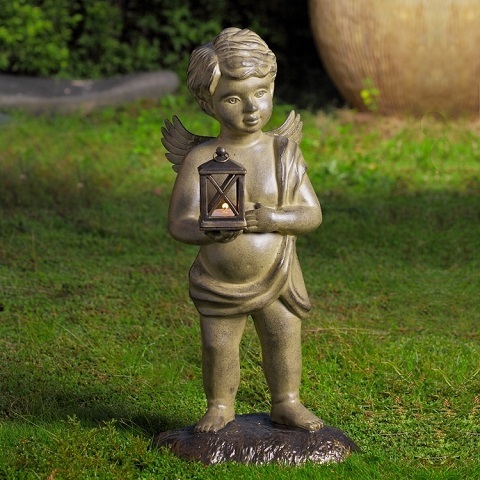 Small illuminated statues won’t give you quite the same dramatic lighting you’d get from a series of electrical spotlights, but they are great for accentuating details in your garden. Even just a little light can help draw the eye to a nice flower bed or other point of interest, and during the day these garden statues blend in better with your landscaping. Other than making your garden look great at night, landscape lighting can also be an important safety feature – especially path lighting, which can help your guests see where they’re going in the dark and prevent falls. If you have winding pathways, stepping stones, or stairs in your garden, it’s particularly important to have them lit up, even if you aren’t planning an elaborate landscape lighting project. Standalone, statue-style path lights can be particularly good for this. They’re a little more attractive than generic solar LEDs on spikes, and give you the light you need to see the way. 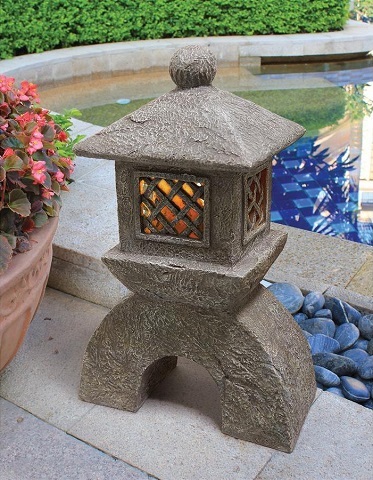 Whether for style or function, candle-lit garden lanterns and statues have a whimsical look that you just can’t get from solar or electric fixtures. They produce a warm, flickering light that’s bright enough to get the job done, but soft enough not to feel harsh. The main drawback, of course, is that the candles in these lanterns eventually burn out, and they’ll need to be lit every time you want to use them and either left to burn down and replaced or extinguished at the end of the evening. On the whole, they’re still much less expensive than hardwired lighting, but be aware that they do require a little more upkeep – especially if you have a lot of them. If you’re looking for a slightly more low-maintenance setup, you might want to opt for solar LED lights instead of candle-lit lanterns. Solar outdoor lights are incredibly common these days, and are an affordable alternative to running electrical wiring through your outdoor spaces, but not all solar lights are created equal. Lots of the inexpensive, generic solar path lights produce a cool, faint light that varies in intensity based on how much light they get during the day. That said, a well-placed solar statue can absorb light all day long and produce a strong light once the sun sets. The main advantage of solar landscape lights is that once you set them outside, they’re more or less self regulating, turning on as soon as it gets dark enough at night and turning off either once their internal, rechargeable batteries run down or when the sun comes up the next morning – whichever comes first. Even weaker LEDs can be a charming addition to your landscape. If you find they’re a bit too dim and unreliable for use as path lighting, an LED statue tucked into your garden can be a fun accent – a little pop of color during the day, and a spot of visual interest once the light clicks on after dark. 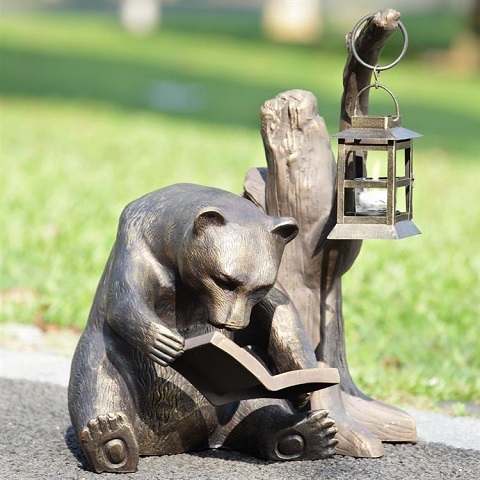 If you’re worried about the strength of a solar light – or about having an open flame near your lawn with a candle-lit lantern – it is possible to find illuminated garden statues that are battery powered, too. The light from these types of fixtures tends to be a little stronger and more consistent than solar powered LED lights, but as with statues that feature candles, they’ll take a little time to set up each night, as they’ll need to be manually turned on and off, and you’ll need to replace or recharge the batteries when they run out as well. Electrical lights are typically the best option for landscape lighting in terms of quantity, quality, and ease of use. 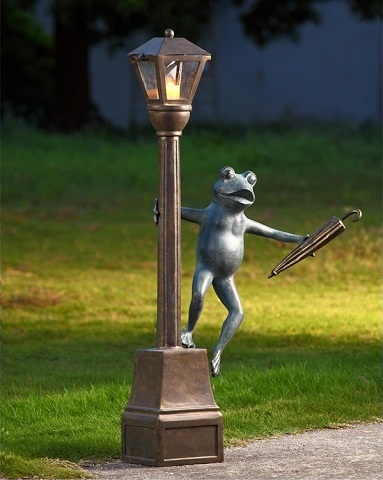 But if you aren’t ready to invest in having a lot of outdoor lighting installed, illuminated garden statues can help close the gap, providing you some of the light you need, and a playful, whimsical feel that will improve the look of your garden by night and day. 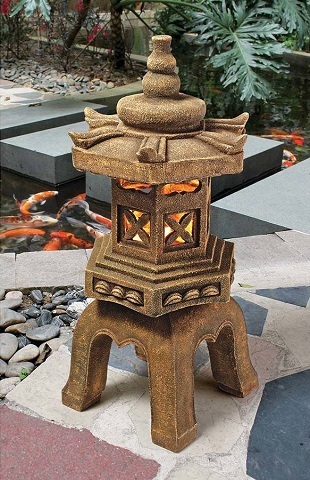 This entry was posted in Lighting, Outdoor Living and tagged garden lanterns, garden lighting, garden statues, illuminated garden statues, Landscape Lighting, low budget outdoor lighting, outdoor lanterns, Outdoor Lighting, solar outdoor lighting.